Photo: PATH/Trevor Snapp. Dr. Eddie Mukooyo Sefuluya (center), a BID Learning Network, participates in a study visit to Tanzania. The whole is greater than the sum of its parts. 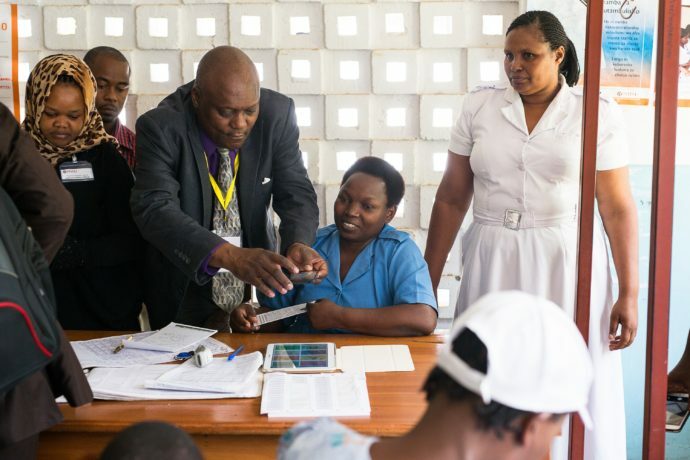 This is how Dr. Eddie Mukooyo Sefuluya, a BID Learning Network (BLN) member and Chairperson for the Uganda AIDS Commission, describes the peer learning network that for the last five years has tackled some of the most complex challenges facing health information systems—and developed its most promising solutions. The BLN comprises more than 20 countries in sub-Saharan Africa. With conversation topics ranging from the design of patient registers to community-based early warning systems for Ebola outbreaks, the BLN allows participants to connect, learn, and collaborate in ways that advance their own discrete efforts, while also accelerating the pace of progress for all. Dr. Mukooyo’s voice bubbles with excitement as he recalls the first time he was invited to speak at a BLN meeting in Ghana. In his 35 years in the field, he had never had an opportunity to share his experience on this scale, among his peers. The day of the meeting, the room was arranged into small clusters of tables and it crackled with energy. It wasn’t like the lecture-style classroom settings he’d experienced before. In this setting, everyone has something to contribute, and everyone has something to learn. Surrounded by government officials from ministries of health all over sub-Saharan Africa, the room swelled with excitement, and everyone’s titles melted away. In their place were the shared experiences of its participants and a common goal to strengthen health information systems with digital solutions.